The University has matriculated 3,807 students offered provisional admission with the Vice-Chancellor, Professor Kolawole Salako declaring that “our new students are among the best that can be admitted”. The Matriculation Ceremony which featured the University’s Sixth Commencement Lecture delivered by Mrs. Oluyemisi Iranloye, Managing Director and Chief Executive Officer of Psaltery International Limited, Ado-Awaye, Oyo State, was held at the University Ceremonial Building. Addressing the matriculating students, their parents, guardians, well-wishers and members of the University Community, among several others, Professor Salako provided and articulated a statistical breakdown of the matriculating students, lending credence to his declaration that those admitted, are among the best that are eligible for admission. According to the breakdown, total applicants to the University were 11,622; 8002 applicants scored 180 and above in UTME, while the number of candidates who attended the screening exercise was 8001. Further breakdown revealed that the number of candidates offered provisional admission stood at 3,807. 2,510 and 1,290 of them were offered provisional admission into agriculture programmes, Science and Engineering programmes respectively. According to the Vice-Chancellor, the number of candidates found not qualified for provisional admission was 3,621; number of registered students 3,438 while the percentage of students registered to total number admitted is 90 percent. Professor Salako who singled out some of the new students for their exceptional performance in UTME lauded them for their exemplary feat. The highly impressed Vice-Chancellor disclosed that Alaka, Yusuf O. (Mechanical Engineering) with JAMB No. 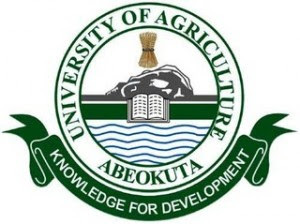 757022971C emerged the University’s best admitted student with JAMB highest score of 340. Professor Salako further revealed that OLADEWA, Victor O. (Electrical Electronic Engineering) with JAMB NO. 75885814AG had the highest Pre-Degree score of 71.98 percent while Adewale, Rihanat D. (Food Science and Technology) with JAMB No. 79231456FI had the highest Direct Entry Score of 78.72 percent. Emphasizing the importance of accreditation to the matriculating students, the Vice-Chancellor gave a breakdown of the accreditation status of some courses offered by the University. According to him, Entrepreneurial Studies (Full Accreditation); Home Science and Management (Full accreditation); Biochemistry (Full Accreditation); Microbiology (Full Accreditation) and Economics (Full Accreditation). He further informed that only Civil Engineering and Electrical/Electronic Engineering have Interim Accreditation. Professor Salako charged the new students to acquaint themselves with the University’s rules and regulations, dress decently, avoid examination malpractices, abstain from defacing the University property and report any form of harassment, etc. While reiterating that the institution recognizes the Student Union, the Vice-Chancellor stated “we prefer dialogue to confrontation”, adding that “we shall always recognize your rights and protect them”. Ending his Address, the Vice-Chancellor surveyed a cross-section of his new students with excitement boldly written on his face and gave his final verdict, “Matriculation affirms that you are our students. Congratulations”. Meanwhile, Mrs. Oluyemisi Iranloye delivered the University Sixth Commencement Lecture with a charge to the newly admitted students to imbibe five (5) mind-set attributes for a productive academic achievement. According to her, they are the disciplined mind, the synthesizing mind, the creative mind, the respectful mind and the ethical mind. She assured the students that if they cultivated the mind-sets aforementioned, “then you are on your way to becoming a great leader. It’s just a matter of time”. Earlier, the Vice-Chancellor, Professor Salako disclosed the rationale behind the Commencement Lecture saying it was borne out of the genuine intention to inspire the students and to ignite and boost their confidence with the conviction that “Yes, You Can if You believe You Can”.